These pixie cut ideas show the mischievous-little-boy cut and lots of elegant new versions that are going from strength to strength in the realm of popular short hairstyles! So if your hair is a bit shapeless right now and needs refreshing, put your feet up and enjoy browsing my latest selection of incredibly stylish pixie cut ideas! Here’s a very popular short haircuts idea that you can achieve on fine, medium and coarse hair, which can be modified to flatter most face shapes. It’s a great choice for round faces, as the absence of fussy curls helps balance out the curves in a circular face. The height on top makes the face appear longer and closely-cut sides bring the eye in, which minimises width at cheek level. 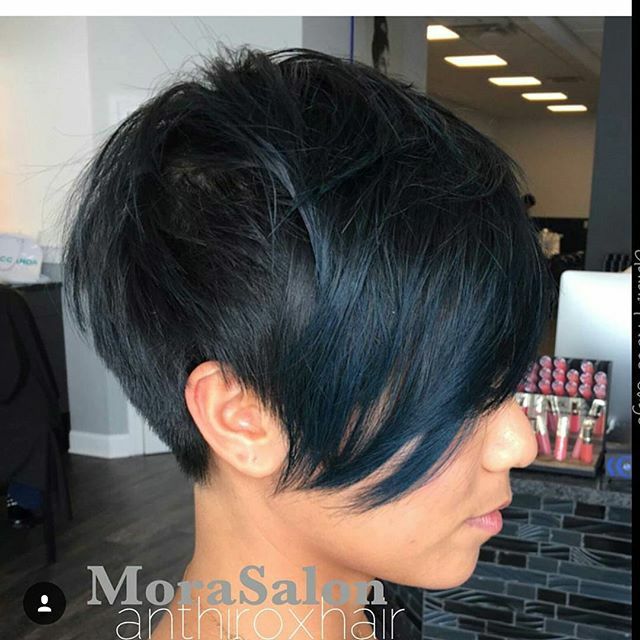 The swept-across pixie hairstyle is still one of the most popular short hairstyles, especially with highlights accentuating the texture and strong movement! 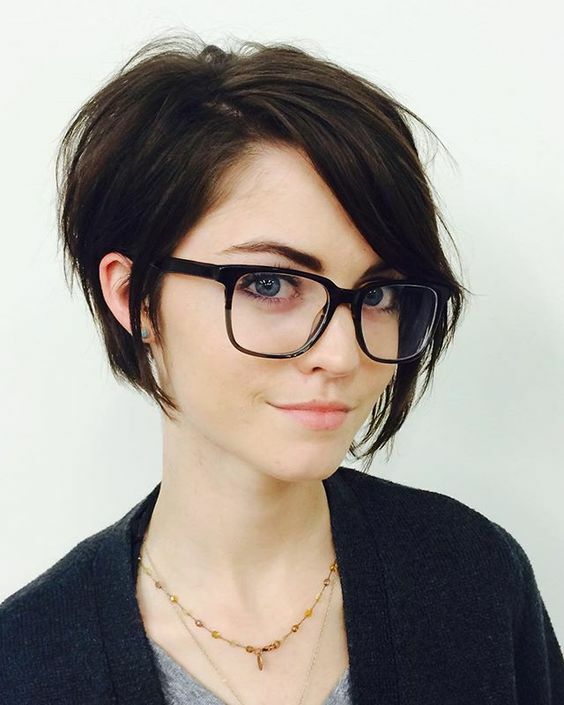 Short boyish haircut for women: Pixies have a reputation for being cute and cheeky, but totally adorable! 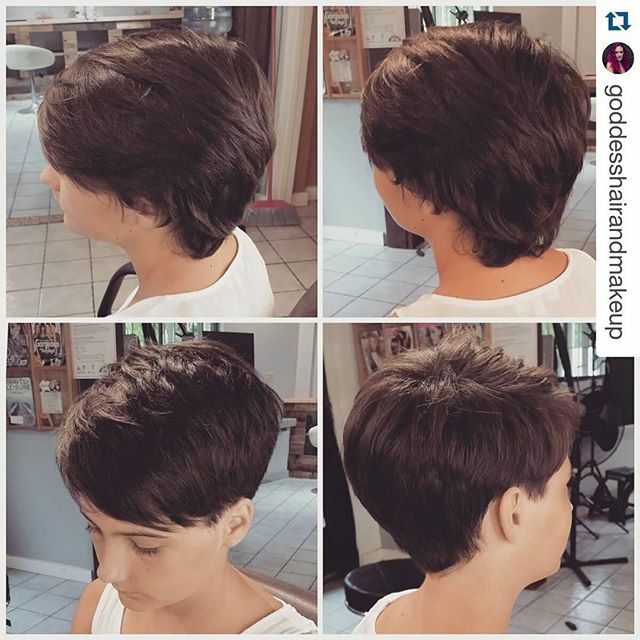 I think this next stylish pixie cut idea captures the ‘cheeky little boy’ look perfectly! 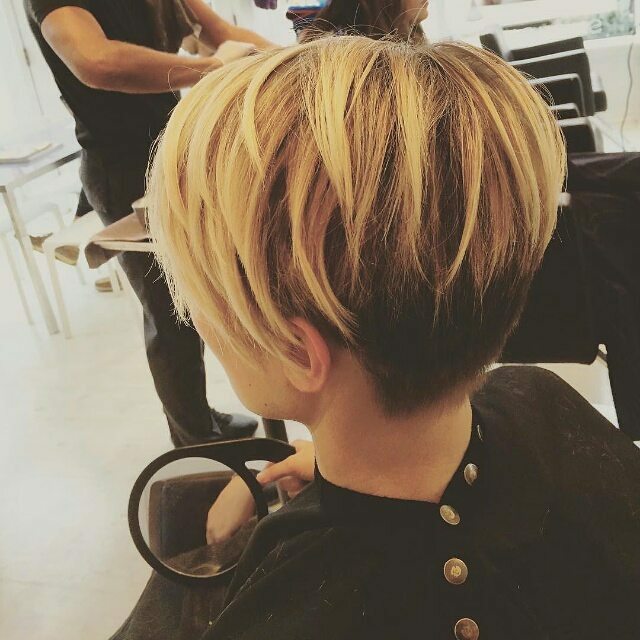 It’s a good pixie cut for thick, straight hair as it has lots of razored layers that have taken out the weight to produce a lovely rounded shape around the head. The razored-edge fringe creates a wispy, slightly ragged edge in the authentic street-urchin style. 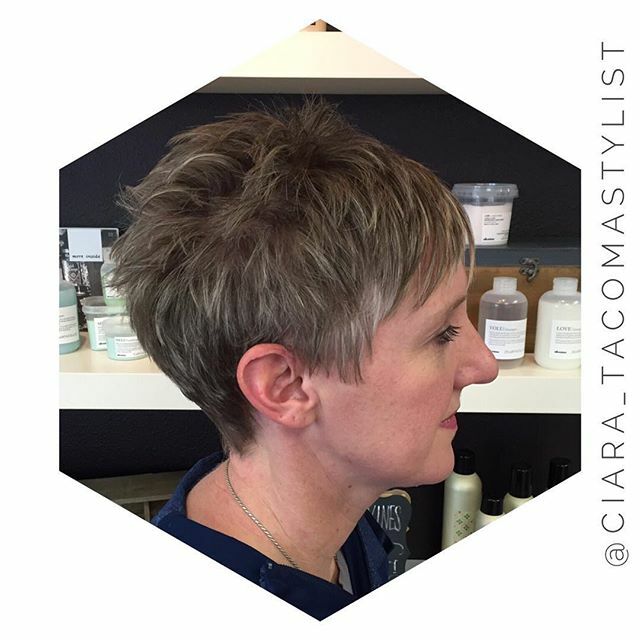 See how this pixie haircut accentuates the eyes and a nicely arched eyebrow in this youthful look – for all ages! 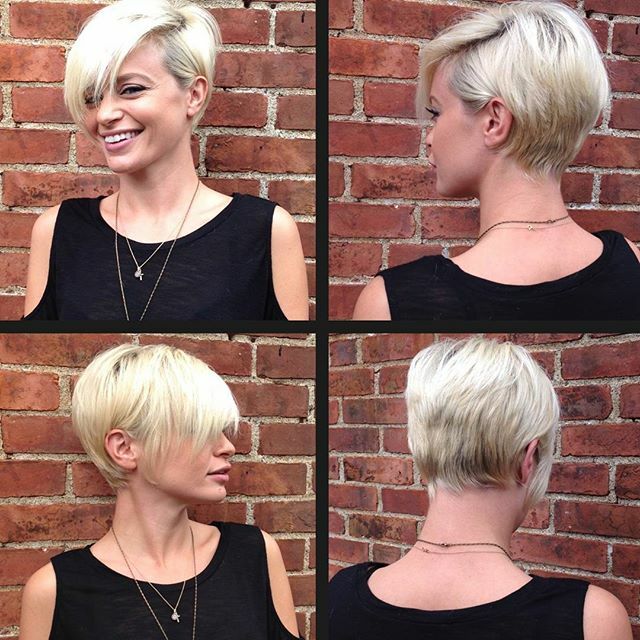 Here’s an ultra-stylish pixie cut idea which plays with extreme asymmetry to create some fabulous contrasts. The side view shows an extra-long, side-swept fringe that creates a strong diagonal line across the front of the face. These style features create a trendy pixie hairstyle that suits oval faces and round or heart shapes, too. The diagonal long fringe is a good way to break up the symmetry and curviness of a round face, to cover up a high forehead and make a long face look better balanced! This cute pixie hairstyle has the sides cut short around the ears allowing the model to show off an ear-stud at the top of one ear. The side-points are short and accentuate the eyes and cheekbones in a flattering way. The front is lightly waved and styled forwards into a soft, wispy fringe that makes a casual V-shape, keeping the look soft and – pleasantly surprising! And a few highlights would really show off the lovely texture. This pretty pixie works on fine-hair to medium-hair types. 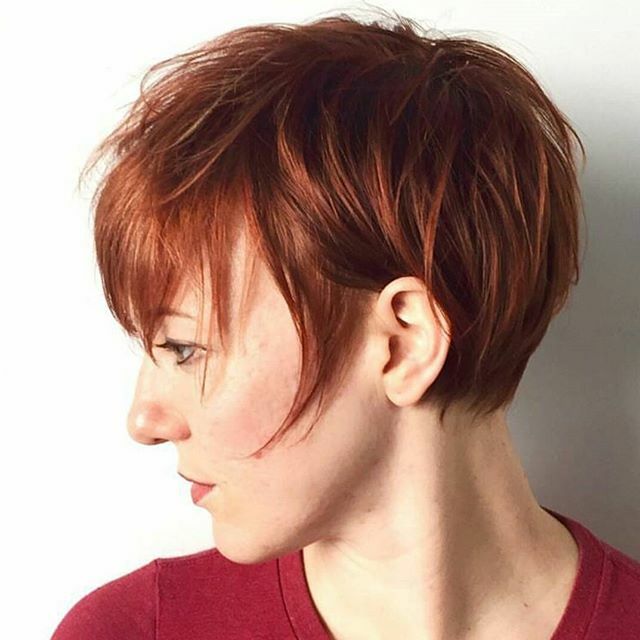 Cut with longish layers, this natural-copper coloured pixie haircut idea is suitable for fine – medium hair. There is a nice symmetry in the curve from crown to nape which matches the curve in the long, piecey fringe. The drama comes from the tousled finish and extra-long side points, which make another attractive curve on the profile. The ends are textured to give beautifully tapered tips. With lots of graceful arcs and tucked lightly behind one or both ears, this is a richly-coloured, ‘smart-casual’ look! 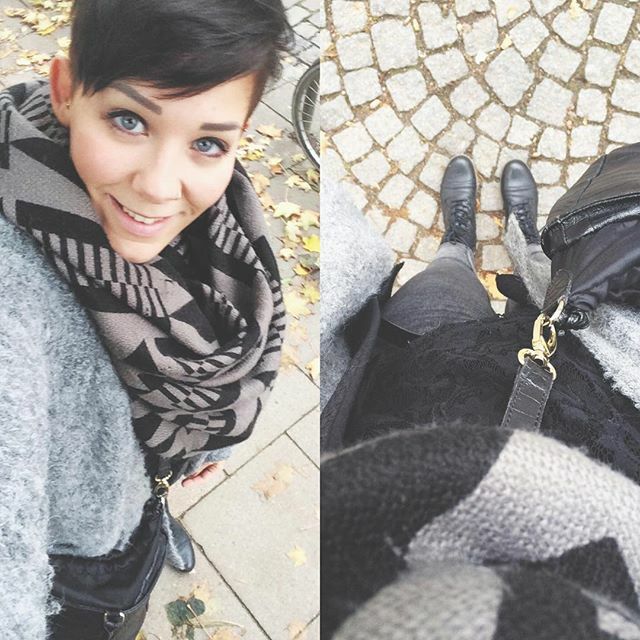 If you’re an unconventional gal, who’s more spice than sugar – here’s a super-stylish pixie cut idea! The general cutting shape is that of an extra-long mohawk to the crown with buzzed sides and back. But the styling is stunning – with straight hair brushed into a smoothed-back D.A. finish, creating a feathery line down the back to the nape. The D.A. was popular in the 1950/60’s for men’s hairstyles and stands for ‘duck’s behind’! Also called the ‘ducktail’ – this unusual pixie hairstyle twist shows there’s a great new short hairstyle for everyone! 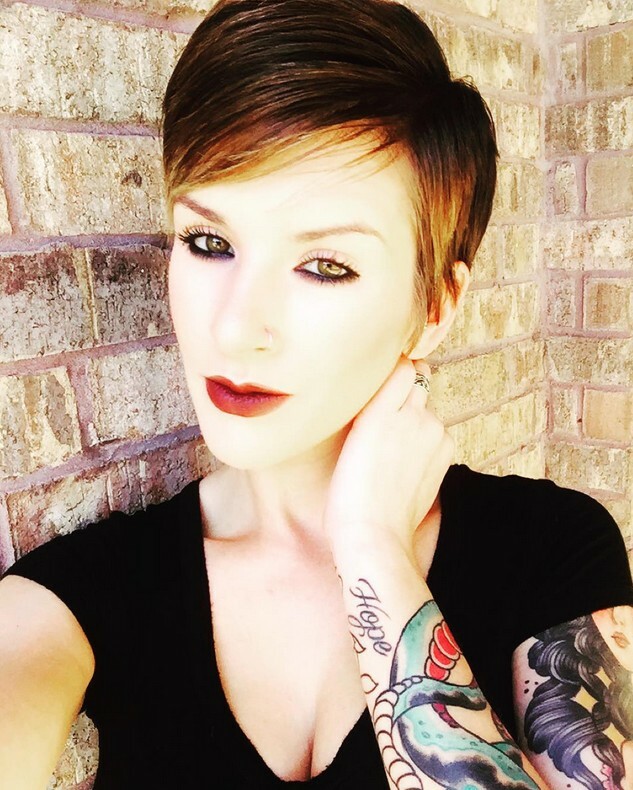 With lots of women now sporting a neck tattoo decorating the nape, it makes sense to choose popular hairstyles that are designed to highlight your skin-art! 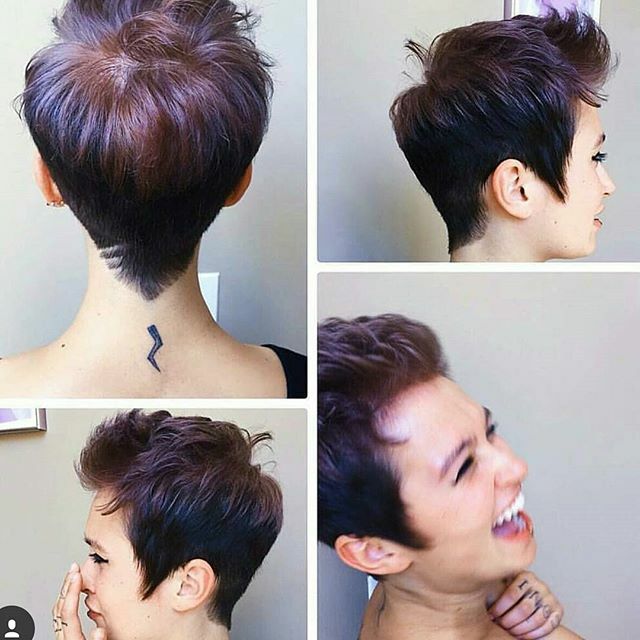 This quirky, but stylish pixie cut has a 3-points shape with long side-burns and a deep V-shaped finish at the nape, ‘pointing’ down to the tattoo below. It’s currently a very popular short hairstyle choice amongst trendy young things, as it works on medium-thick and fine hair and the style flatters a round face. With 3 cheeky lines added as a final touch and a curled-back quiff at the front, this is a playful and original new look! Another new trend is the nose-ring piercing, which is actually a traditional ‘bull-ring’. As a popular trend for spring/summer 2016, nose-rings and neck tattoos can be cleverly displayed with a well-cut short hairstyle. This is another variation of the versatile, short-back-and-sides, left-long-on-the-top, we’ve pinched from the boys. With the full fringe combed forwards, the focus is on the nose and mouth. The cut-around-the-ear sides reveal the ear-piercings and neck tattoos. And the closely-cropped back displays a beautiful curve into the neck and shows off a cute heart tat. Can be tailored to suit almost all face-shapes by adding a side-parting, or a front quiff or by varying the fringe! Not everyone wants to be the centre of attention with an unusual or ultra-modern hairstyle, of course! Most of us want an easy style that’s tailored to flatter our face and work with our hair-type! 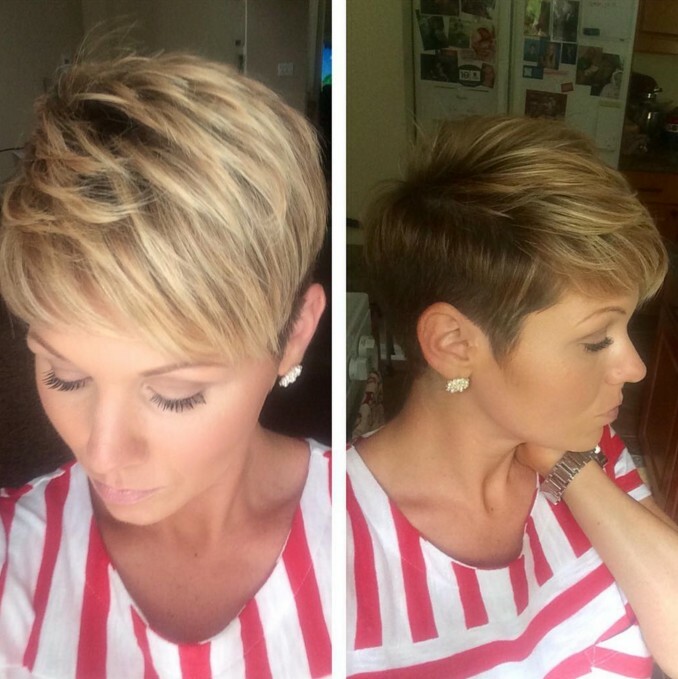 This is a lovely medium pixie hairstyle for thick dark hair with a little natural wave. The deep side-parting makes an attractive, slanted fringe that just cuts off the corner of the forehead. This is a good way to reduce a wide forehead, but leave plenty on show at the front to elongate the face shape. The back has long layers in a cute natural wave and a cute, little point at the nape! Here’s a great new twist that packs a real style punch! 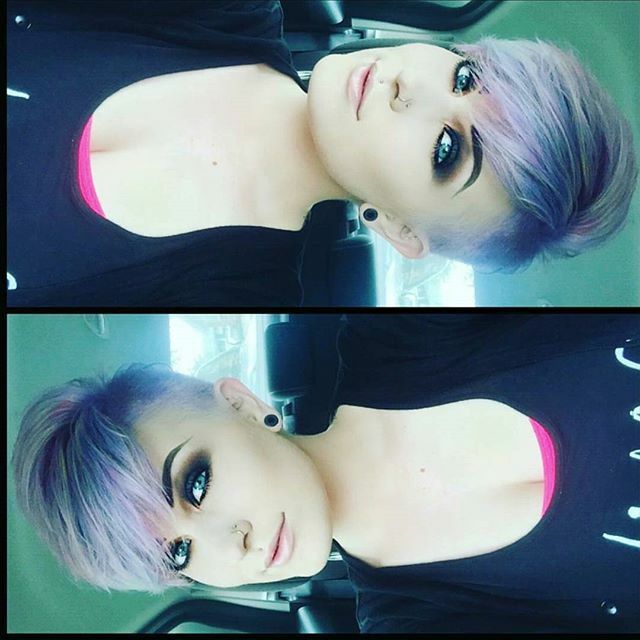 The ‘dark roots, blonde hair’ pixie takes on a futuristic look with purple roots fading to a pretty, lavender shade! It’s extremely asymmetrical too, with one side buzz-cut under a deep side-parting and the other side swept over the head. The tips are heavily textured to create a sharp tapered edge. This look works on medium – thick hair and looks great with pale lipstick and lots of eye-makeup! Want to know the hottest hair color ideas in this year? Check out this post. 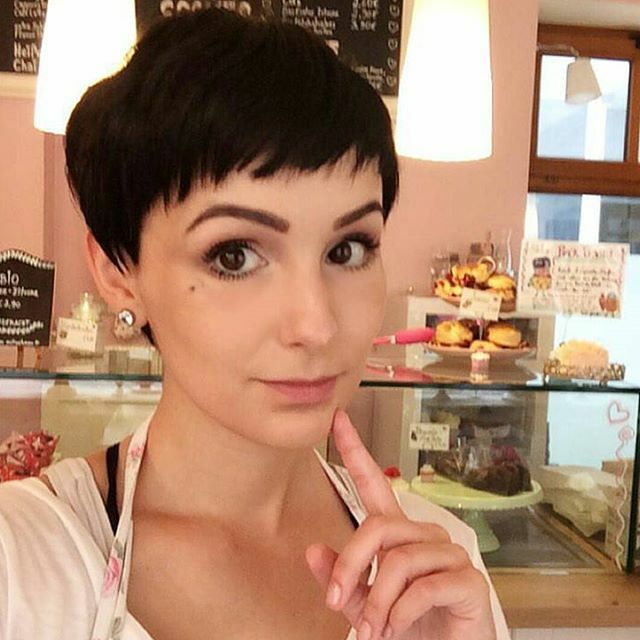 I have to confess that I love to see this classic, short-all-round pixie haircut showcasing a pretty face with small features! It’s a vintage look from the days when celebs wouldn’t be seen dead with even a hint of dark roots showing through. It creates a softer, glam look with a pale-gold blonde shade all-over instead of strident black roots. The short fringe hovers gently over the rounded hairline and the pointed side-sections frame the eyes and cheekbones beautifully! These ‘before and after’ photos are a great help if you’re trying to decide whether to go shorter or not. The model’s healthy, warm-brown hair looks good, but unremarkable, in the before pics. 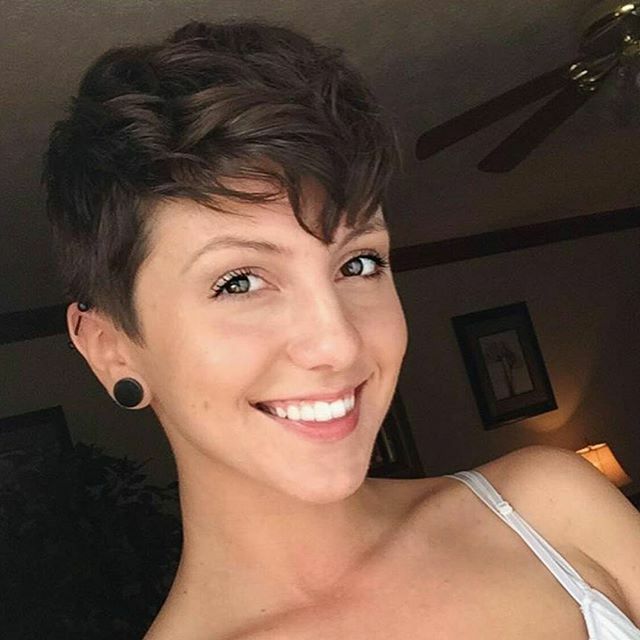 However, the after pics show an incredibly stylish pixie cut that flatters the model by revealing her cute profile and creating more natural volume at the crown. Although there is only one young women here, I felt as if the person with the longer pixie was older! And the image of ‘the girl’ with a shorter pixie – was like her younger sister! Short haircut for round faces: This platinum-blonde long pixie hairstyle needs a lot of conditioning to keep your hair from looking damaged. It’s best for light-coloured natural colours, that don’t need to be lightened from a dark colour. On the other hand, controlled bleaching is a good way to get some extra volume into healthy, fine hair! This example of popular short hairstyles features the long asymmetrical fringe that can be worn straight or wavy to vary your look! If your hair is in a difficult, ‘salt and pepper’ stage or almost white, here’s a way to enhance it with some delicately applied dual highlights. 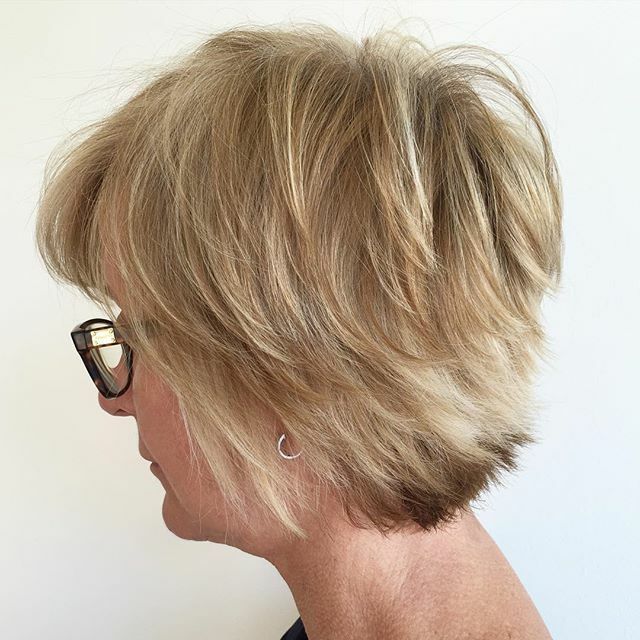 This is one of the most popular short hairstyles for women over 50, but it often needs some extra colour to make it suitably stylish and flattering. So along with the dual highlights, why not add this contrasting warm brown section above the nape! This highly professional photo-effect suggests a special, short hairstyle we should take a good look at! I agree, ‘cos it is full of excellent face-flattering features! The full, round shape above the deep side-parting counteracts the slightly narrow chin by adding width. The asymmetrical, side-swept fringe helps to reduce the length of a long face-shape. The lovely medium-gold highlighting is one of the most flattering blonde shades, that warms up a pale or ‘cold’ complexion. And taking the gleaming highlights down to include the short side-burns is a fresh idea that looks great. Lighter colour accents around the face help to soften any hard angles. Short hair ideas for women over 40: If your natural colour is dark-blonde, dirty-blonde or mousey-brown, it’s best to add a little more colour dimension to avoid it looking drab. If you have a slightly red complexion, like this model, cool shades can help to tone down your rosy complexion. Mousey hair is perfect for a pixie pick-me-up and with a stylish cut and delicate, cool-blonde or coppery highlights, you can get an attractive feathery texture! One of the next colour trends for spring/summer is bronde, which means mousey hair doesn’t have to have cool highlights to lift it to blonde. Bronde is light-brown and luminous, including a range of warm, light-gold or coppery-brown shades that are easy to maintain in a short hairstyle like this jaunty pixie! 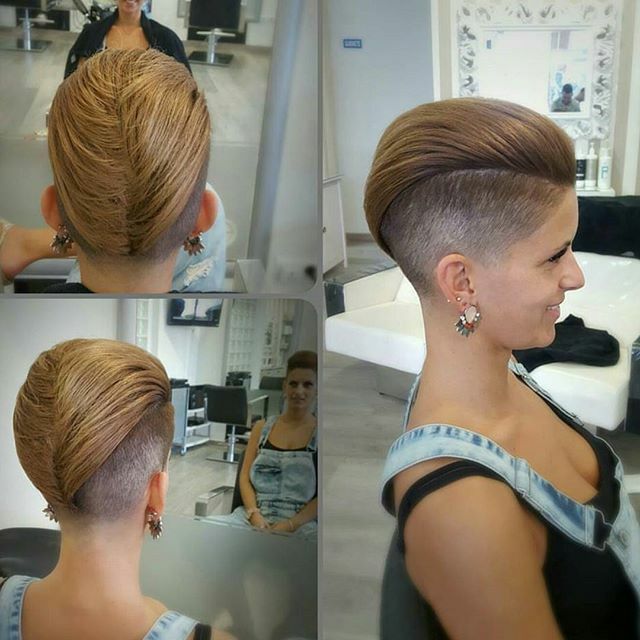 Layered short haircut for women: Thick hair looks fantastic in this long and incredibly stylish pixie haircut! The hair has been cut vertically in sliced layers, which thins out that annoying bulk and creates a lovely round contour – like a chrysanthemum! The long fringe is heavily highlighted in a popular golden-blonde shade that suits most complexions, and the under-layers and back are a contrasting warm brown shade. To finish this fabulous pixie hairstyle, there is extra height at the crown where the two colours are blended in defined strands for a very eye-catching (in a good way!) and stylish ‘do! Short haircut with bangs: Naturally straight, strong, dark hair needs a firm hand if it’s going to add to your beauty-look! Pixies are popular short haircuts for this hair-type as the natural body in thick hair can be sculpted into really stylish geometric shapes. This cute young woman knows how to show off a lovely, clear complexion and blue eyes with a trendy, side-swept fringe. 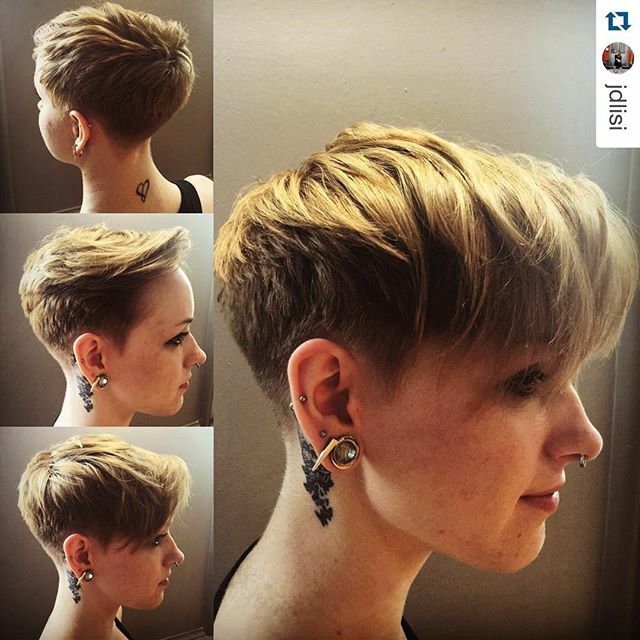 No fuss needed with this popular short haircut, leaving you more time to have fun! Short haircuts for 2016: It sounds complicated, but as you can see from the model below, it’s a simple and super-stylish pixie cut! We’re getting more daring with rainbow tints each year and what started as an annual summer fun-time colour flash, is gaining more popularity and coverage through the whole year! This style is suitable for medium-thick hair and the shade of green should be chosen to complement your skin tone. This delicate blend of ocean colours suggests a street-smart mermaid who’s updated her image and set up her own sea-weed nutritional supplement business! The deep side parting distracts attention from a slightly prominent nose and the buzzed undercut contrasts with the lovely sweeping fringe! 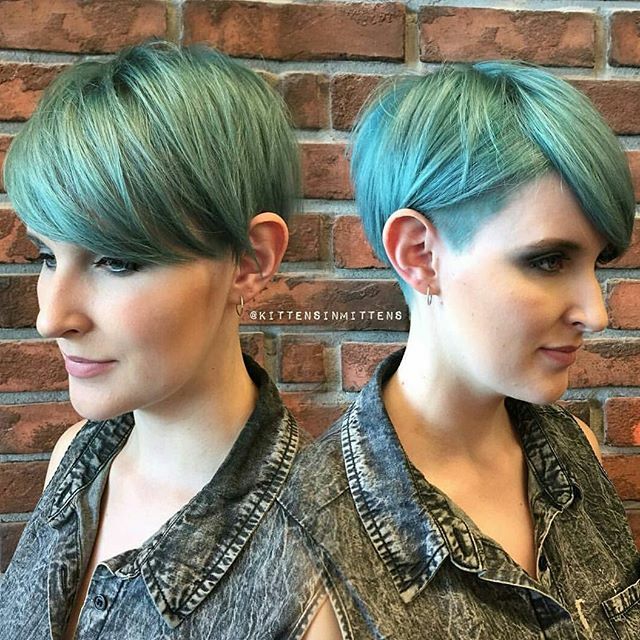 Well, what d’ya think of these incredibly stylish pixie cuts? I hope you’ll find enough inspiration to keep you happy for this week! Study your face shape and skin tone, to help you narrow down the best pixie cuts for you. And don’t forget to pop back soon for even more top new short haircut ideas on hairstylesweekly.com! Here’s a great new twist that packs a real style punch! 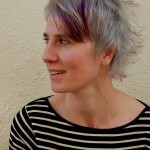 The ‘dark roots, blonde hair’ pixie takes on a futuristic look with purple roots fading to a pretty, lavender shade! It’s extremely asymmetrical too, with one side buzz-cut under a deep side-parting and the other side swept over the head. The tips are heavily textured to create a sharp tapered edge. This look works on medium – thick hair and looks great with pale lipstick and lots of eye-makeup! 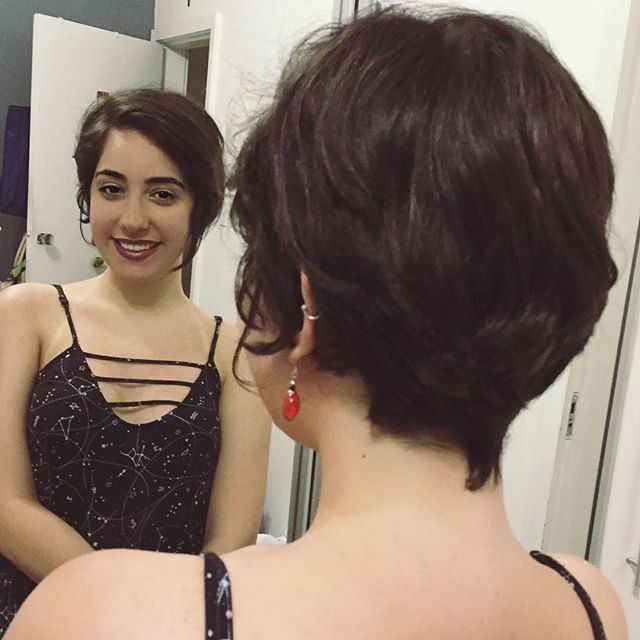 Short haircuts for 2019: It sounds complicated, but as you can see from the model below, it’s a simple and super-stylish pixie cut! We’re getting more daring with rainbow tints each year and what started as an annual summer fun-time colour flash, is gaining more popularity and coverage through the whole year! This style is suitable for medium-thick hair and the shade of green should be chosen to complement your skin tone. This delicate blend of ocean colours suggests a street-smart mermaid who’s updated her image and set up her own sea-weed nutritional supplement business! The deep side parting distracts attention from a slightly prominent nose and the buzzed undercut contrasts with the lovely sweeping fringe! Under: Popular Hairstyles Futuristic Boho Chic – Gorgeous Grey & Purple!